Relaxed afternoon of board and card games. Learn a new game, try a classic or bring your own. Board and card games of all kinds will be available from the library's Games Collection including KingDomino, Forbidden Island, Sushi Go, Splendor, Karuba and Century: Spice Road. We also have classics like Cribbage, Checkers and Chess. You can also bring along your own favourite game, as long as you’re willing to teach others how to play! Families and people of all ages are welcome. 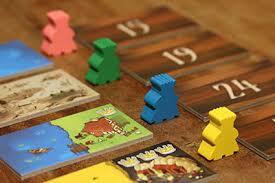 Board games - promoting less screen time and more face time since ... forever.